Laurelhurst Craftsman Bungalow: Found a Pot Rack! Sharon is pretty excited because she thinks she finally solved the last puzzle we had for our kitchen remodel! Jeff wants to recess a portion of our dropped kitchen ceiling to install a pot rack and we needed to know by April 4 what pot rack we would be buying. Sharon's been shopping for a while now, but everything was either crummy made-in-China crap or very expensive. Today, she finally found a locally-made pot rack that appears to be quite affordable. The website is Yardley Forge and according to Google they're even located in Portland! We are hoping we can get this modified a little bit so that it doesn't hang quite as low, but otherwise this is just what we've been looking for. 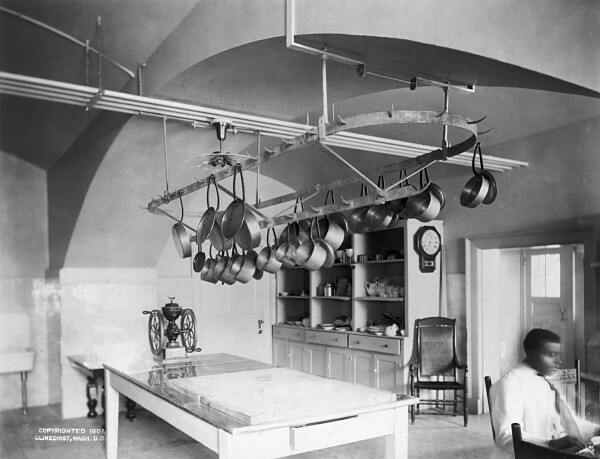 Here is our period picture of a kitchen pot rack—taken in the White House kitchen in 1901, according to the original source.